A tree can bewitch you offering a sense of mystery and magic, taking you into the journey of green respect towards this witness of time passing, into the wisdom of its mature being. Its roots lie deep in the ground. The leaves draw energy from the sunlight. The trunk is strong and wide. What is the tree hiding: ancient secrets, ghosts, goblins, spirits, ferries or just squirrels? According to the Ancient Slav Zodiac we all have our Tree Signs. Find the date of your birth and enjoy the spiritual meaning of the Tree that protects you. A Fig Tree is a tree of feelings. The olives absorb the energy around them. You are capable to understand the whole spectrum of feelings. Good natured, gentle and sentimental your happiness might fluctuate. Around the spine to the head represented by wings of Mercury. The central rod is Sushumna passing through the spine to the pineal gland into altered states of consciousness. The symmetrical arrangements of two snakes symbolize the moving opposing forces balancing one another creating a higher static form. Is there a specific animal that fascinates you more than the rest? Is there an animal that you associate yourself with? Is there a quality that you can relate to? For Shamans, each animal has a lesson to teach us and main qualities of animals are captured within their animal spirits that come into contact with us to heal us and inspire us in our spiritual journey. Their special energies can teach us and guide us in our search. Ask your inner being what your inner animal is, and let its qualities inspire you. Alchemy Symbols and What is Alchemy? the secret art of the land of Khem (an ancient name for the land of Egypt), is maybe one of the two oldest sciences known to the world. an angel gave Adam the mysteries and secrets of Kabbalah and of Alchemy, promising that when the human race understand these inspired arts, the curse of the forbidden fruit would be removed and man will again enter into the Garden of Eden. Awakening or alchemical re-birth requires a precise Spiritual Method. Hidden among obscure drawings and fascinating art work of ancient cultures is the re-occurring symbolism of the Tree of Life. Seeking immortality, seeking perfection, searching for Lapis, the Philosophers Stone, Alchemists, Cabbalists, Taoists, Yogis, Mystics of our past experimented with physical manifestations, with their bodies, emotions, thoughts, offering formulas hidden within a vail of images, symbols, mantras, for mystics of the future to contemplate and follow. The meaning of the 'Tree of Life' is very powerful and it is often seen as the Key to Consciousness, Enlightenment, Bliss. The Mayan believed heaven to be a wonderful, magical place on Earth hidden by a mystical mountain. They called this place Tamoanchan. Heaven, Earth, and Underworld (Xibalba) were connected by the ‘world tree’. The world tree grew at the locus of creation, all things flowing out from that spot into four directions. Read more about Mayan World Tree, Babilonian Axis Mundi, Nordic Ygdrassil. Many say that the highest energy occurs at the Full Moon. The peak of peaks it was during this year’s Bright Moon. The symbolism of ‘light’ all across the cultures connects us with consciousness, wisdom, moral purity, intelligence, angels, beauty. The worship of light in the form of sun worshipor fire worship is one of the earliest form of worships. The Tree of Life starts with a triad. The seasons change while the Earth continues its journey through the space and time. Rituals at the Autumn Equinox honour balance between light and dark. Bhagvad Gi:tā says: om tatsatiti nirdesho brahmanstrividhah samratah - OM, tat and sat are the triple terms of Brahman - Truth, Consciousness and Bliss. In Advaita philosophy it represents three merged into one, a trinity. It is made of three letters: A, U and M that, it is believed, contain all other sounds. It is a mantra that if repeated can resonate with the soul. Many use this symbol as an expression of spiritual perfection. Doves are considered a symbol of faithful and eternal love because they mate for life. Depictions of two doves together symbolize everlasting love. Gypsies believe that the dove is a messengers of love from the spirit world. 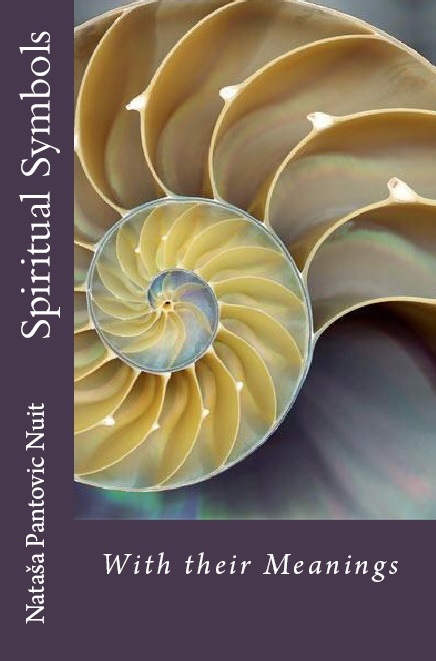 These are the Excerpts from Spiritual Symbols Book that can be purchased from AMAZON for only eur12.